Enhancing children’s connections with nature has emerged as a “hot” topic in child development and learning discourses over the last decade and in the context of childhood that is increasingly screen mediated. Privileged, Minority (Western) modernity perspectives dominate, with a harking back to a romantic view of (usually young) children frolicking in nature. Rarely is there consideration of diversity within the discourse, in terms of lifestage or cultural, geographic, and socioeconomic contexts. 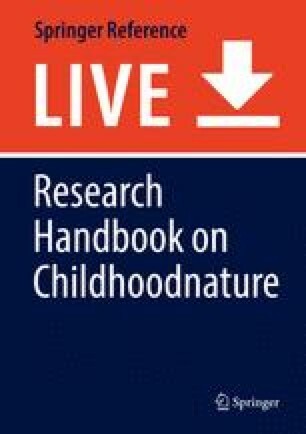 In this chapter, adolescents from a range of Majority (non-Western) situations in India, Nepal, and Bangladesh contribute their perceptions, conceptualizations, and practices of nature in their lives as researchers within a “child-framed” methodology (Barratt Hacking, Cutter-Mackenzie, & Barratt, Children as active researchers: The potential of environmental education research involving children. In B. Stevenson Robert, M. Brody, J. Dillon, A. Wals (Eds. ), International handbook of research on environmental education (pp. 438–458). New York: AERA/Routledge, 2013). Socioecological factors influence the adolescents’ nature knowledge, attitudes, and pro-environmental behaviors. The adolescents in these Majority contexts live intimately connected to natural systems, but the life for these adolescents in India, Nepal, and Bangladesh is very different to that of dominant conceptualizations of Minority-style childhoodnature. The factors that influence their nature connectedness provide alternatives for conceptualizing and nurturing childhoodnature. Mead, M. (1977). Children, culture, and Edith Cobb. Paper presented at the children, nature, and the urban environment: Proceedings of a symposium-fair. Accessed via http://scholar.google.ca/scholar?q=Children%2C+culture%2C+and+Edith+Cobb&btnG=&hl=en&as_sdt=0%2C5. 1 May 2017. Pointon, P. (2013). ‘The city snuffs out nature’: Young people’s conceptions of and relationship with nature. Environmental Education Research, 1–19. https://doi.org/10.1080/13504622.2013.833595.